As an IT security professional, you’ve hopefully applied some baseline Group Policy settings to your workstations. Recently, if you’ve upgraded any of those workstations to the Windows 10 Creators Update, your administrators might have noticed that they can no longer access the C$ Admin Share by going to \\ComputerName\c$, however, it might still be accessible by going to \\IPaddress\c$. 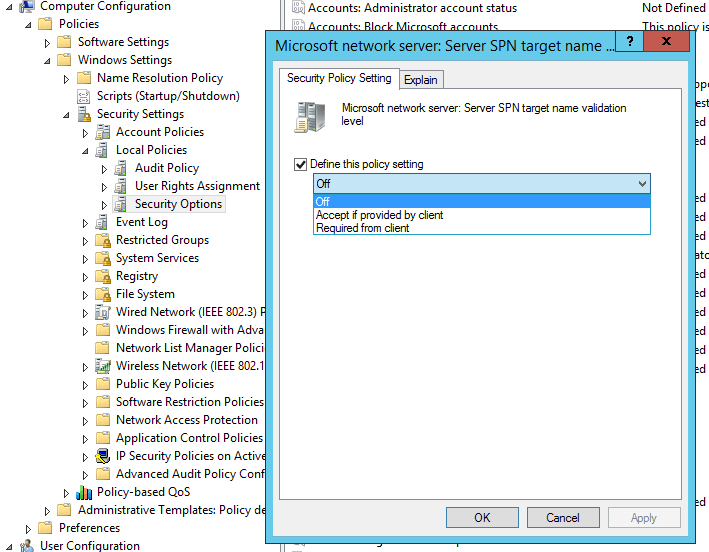 The reason for this is that most Windows Security Baselines change a setting called “Server SPN target name validation level” to “Accept if provided by client“. While this setting worked fine in previous version of Windows, it seems to cause issues when using the Windows 10 Creators Update version 1703. Change this setting to Off. Then on your workstations, run “gpupdate /force” from a command prompt and reboot the computer. You can read more about the issue in this Microsoft TechNet thread.